Meg Aubrey’s paintings feature larger-than-life, colorfully adorned figures, like the soccer moms cheering on children at play on a green, well-manicured playing field. 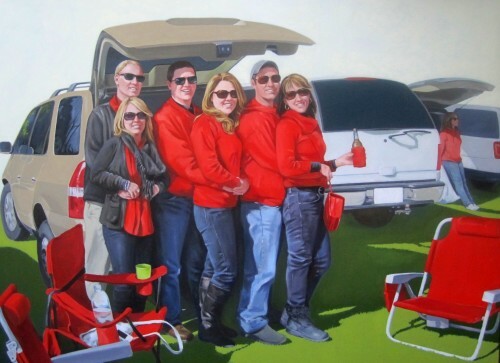 Another painting contains similarly dressed white couples with beverages in hand seemingly posing for a group photo at a pre-game tailgating event. The combination of bucolic landscapes and the nearly identical uniforms of fandom evoke both the comfort and conformity of suburbia, a theme that runs through much of Aubrey’s art. This entry was posted in News on April 26, 2013 by gallerymanager.